LEXINGTON, Ky. (Nov. 13, 2017) — When George Quintero first heard about a new clinical trial that could improve motor function in stroke patients, he knew he had to find a way to bring it to UK HealthCare. A research analyst for the University of Kentucky Department of Neuroscience, Quintero first obtained a list of criteria to apply. 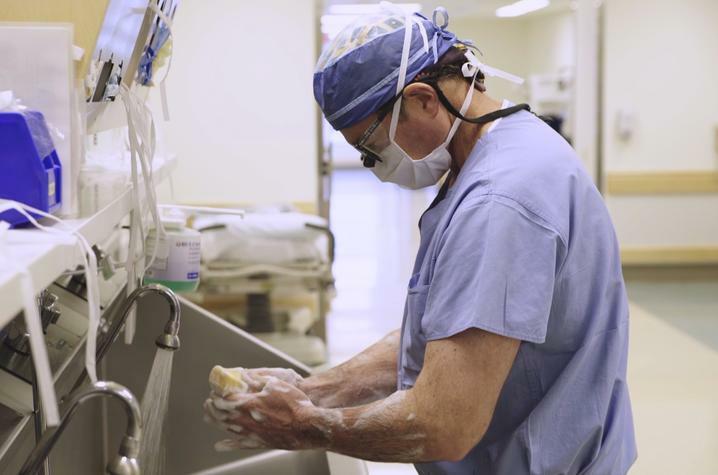 The phase II trial required a physician with experience in frame-based surgery, which was easy for UK to fulfill: Dr. Craig van Horne, a neurosurgeon for the Kentucky Neuroscience Institute, has been performing this style of surgery on neurology patients for more than 20 years. The second required element was a bit trickier. To be a treatment site for this innovative trial, the stroke team needed resources and buy-in from a stem cell lab with specific cell processing skills near the hospital. "Originally, we thought we just needed a cell lab," Quintero said. 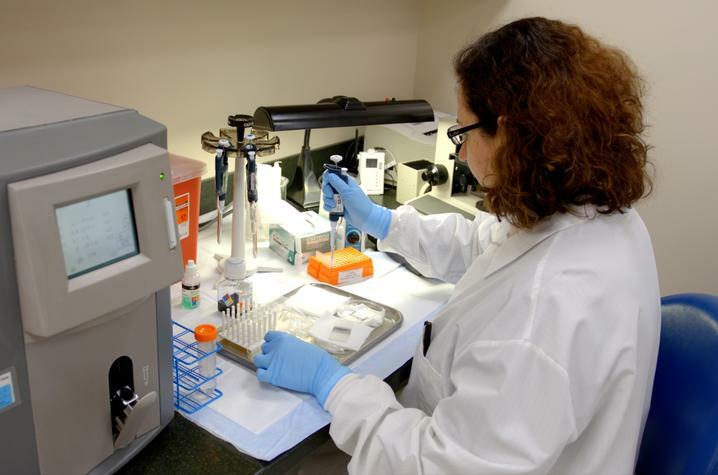 "We realized we didn't have any experience in the sort of cell delivery we needed. My background is basic sciences and I have a plain cell lab, so it wouldn't be sufficient." Quintero hunted for an appropriate lab across the city, beginning with UK's Center for Clinical and Translational Science (CCTS). He combed through the work of individual investigators, then tried to identify facilities around town that would have the means and experience to carry out the specific stem cell work needed for the trial. After running into several dead ends, he stumbled upon the idea of bone marrow transplants, which use stem cells collected from bone marrow to repopulate the blood after aggressive treatment for blood cancers. Quintero finally had a lead: just across the street from KNI, the UK Markey Cancer Center's Blood and Marrow Transplantation (BMT) Program performs upwards of 100 bone marrow transplants for patients each year. Quintero reached out to Dr. Gerhard Hildebrandt, division chief of Hematology and Blood and Marrow Transplantation at UK. Though the work required was unrelated to the usual duties of the stem cell lab, Quintero says Hildebrandt was on board with the project. "He was very excited," Quintero said. "He thought that sort of stem cell delivery for neurological diseases would be a really advantageous thing for UK to have. So he was an early supporter of us moving forward, and he got me in touch with the group at the cell lab." Tucked away on the second floor of Albert B. Chandler Hospital, the three staff members of UK's stem cell lab – lab manager Rita Hill and medical technologists Martha Pat Kinney and Giovi Hidalgo – quietly and efficiently go about their work of preparing stem cells for bone marrow transplant patients at the UK Markey Cancer Center. Overseen by Dr. Roger Herzig, medical director of Markey's Blood and Marrow Transplant Program, the lab processes stem cells for both autologous transplants – those using the patient's own stem cells – and allogenic transplants, in which stem cells harvested from related or unrelated donors are used. When presented the opportunity to help KNI participate in this trial, Herzig gave his immediate approval, having previously collaborated on other projects at UK HealthCare. Hill says the team was interested but had some initial reservations because of their already busy workload – to do the study, the Markey stem cell team would have to take on additional work outside of their usual service area. "I first met Dr. Quintero and he gave us a protocol to look at, and wanted to know if we were interested," Hill said. "We thought, 'Yes.' But there is a time restraint and with the BMT program rolling, we weren't sure if we could really support it." For the trial to work, the stem cell team would have to work closely with Quintero and Van Horne to ensure seamless patient care. The lab would receive genetically modified stem cells from the pharmaceutical company, process the cells for implantation per trial protocol, and deliver them to Quintero. Once he signed off, van Horne would initiate the procedure: drilling a small hole into the patient's skull and injecting the stem cells into the brain. Because most of the patients in the trial would be traveling long distances just for this procedure, it was essential to have the process streamlined and efficient from start to finish. "An idea is pretty easy to have and say, 'Let's do this!'" Van Horne said. "But when you realize all the work that has to go into these things, it's phenomenal." First, scheduling was key. Hill says Quintero and van Horne were willing to be flexible on the timing of when they could bring in patients, and they worked out a schedule that wouldn't conflict with their normal duties for Markey. Secondly, Hill and her team looked closely at the protocol, and noted some small elements of the process that could be improved. After several conversations with the sponsor of the trial, the company even adopted Hill's suggestions and implemented them at other trial sites nationwide. "One of the advantages of having Rita is that she has a lot of expertise in managing cell labs and the requirements of cell processing," Quintero said. "She sort of gave some direction that the study needed, and the study welcomed that because they wanted the input from individuals to make the project better." In a culture that's becoming increasingly divisive in everything from politics to sports to entertainment, it's refreshing to see groups from different areas compromising and working together to further the common goal of improving patient care. This recent trial is yet another example of what van Horne describes as "the proliferation of collaborative culture to solve human problems" across UK's academic and healthcare campuses. "One of the things that I think is unique about UK is there's really a culture of collaboration," van Horne said. "I've previously been in other institutions where that culture doesn't exist… It's not, 'This is too much, we just can't do this,' but 'Oh, that's a great idea, let's figure out a way to make that work.' And everybody stepped up and pitched in and made it happen." "This kind of collaboration is what keeps making the research and the medicine new," Herzig said. "And that's what keeps me coming back to work." It's not the first time the stem cell lab has stepped up to help other across the medical campus. They've previously assisted with stem cell research in nephrology and cardiology. Participating in these outside projects has helped the team learn more about what properties stem cells possess aside from the ability to reconstitute blood, which may prove useful in future endeavors. "Part of the academic mission is collaboration; that allows us to tackle problems that individually we can't do," Herzig said. "You never know what technique you have today that you'll be able to transfer to a different situation tomorrow. The things that we're learning from this are probably going to be helpful in other future projects." 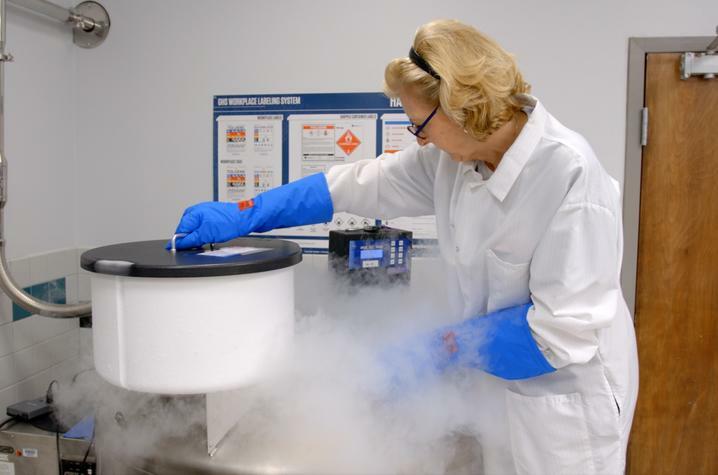 Hill and her team spend most of their working time in the lab, but they do personally deliver stem cells to the bone marrow transplant patients who are preparing to undergo their infusions, giving them a brief encounter with the person who will be benefiting from their work. In addition to simply "enjoying the science" of this new project, Hill says the idea of helping even more patients provides some extra personal motivation. "Who knows, you could have a family member or loved one later on who suffers from a stroke, and this trial could benefit them in the future," she said. "Why wouldn't you want to help?"